My son's favourite so far. He has just started weaning and this truly went down a treat. I will be most certainly get this in again. My fussy son loved it. It was easy to prepare and a great size jar. Didn't smell too bad either. This is great - I have fed it to two of my children so far, and will feed it to my youngest when he is old enough. It comes in a jar, has a nice long shelf life, easy to store, and the jar can be recycled afterwards, unlike pouches. It seems to taste good - it has always gone down well. Its doesn't look very nice. But what baby food does? My twins love the chicken sunday lunch. At 6 months old and advised to wean a little earlier we're kust trying new flavours. Its the only 1 my twin 2 will eat so far. Ive always used cow and gate jars even with my eldest and ive not once had any problems. My little girl loves these. I don't mind the taste myself lol. Good size jars that fit nicely into our change bag. I like that they are easy to open and have a good shelf life. I find any spillage wash out great and don't stain. This was one of the few meal we first tried, he absolutely loved it he just couldn’t get enough of it, he now has it once a week. My babies loves to eat this food, it's very easy when you're on the road and don't take too many casseroles with food. It's perfect! My little girl first tried this about a month ago and it’s her absolute favourite meal! It’s the one meal I know she will devour without touching the sides! My little one loves this jar and for once it’s something yummy and dairy free without being a hideous orange colour that stains. It’s a nice consistency and my little boy really enjoys it! It does go a bit thinner when warmed so can sometimes be abit runny. The jars are a good size for little ones and the jar can be rescaled and popped in the fridge for up to 48 hours which saves food waste too. This was one of the first meals we tried it doesn't look very appetising but he loved it he really couldnt get enough of it is. there is a good amount in the jar so no hungry bellys after feeding. I found these needed a little more prep time to some of the pouch meals I now use when out but not an issue if not on the go all the time. My first born loved these food jars, especially this flavour when she was weaning a couple of years ago. Great way to introduce flavours and textures in a ready to eat jar. I shall be using these for going out and about with my youngest once’s she starts weaning properly. Love cow and gate for prepared meals! Price, small amount for price. 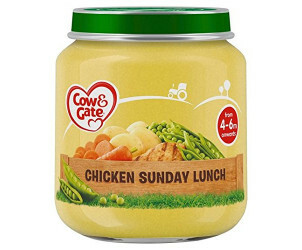 My child loved this jar of food, she liked almost all the cow and gate jars (as temperature tester so did i). I didnt have time to prepare fresh puréed food so these jars were a life saver that allowed different tastes to be explored. This little jar is the perfect size for my boys little tummy and if he’s not feeling too hungry we can just save half for later. The perfect nutritious meal that take no faff and is ready in seconds. Easy. Tasty. Great to start them off. Great for a first food. You get to see what they like without the drama. Tasty easy to digest. Easy to eat when spoon fed. Lots of varietys. Cheap to buy and aleays have offers. Super delishious and full of nutrients! This was my girls Favourite dinner at the time, she loved joining in on a Sunday lunch time with her own little Sunday dinner! Brilliant tasting food for my little one, both of my youngest children loved this! But expensive for a little jar! Such a lovely little dinner for baby’s brilliant consistency, My two youngest boys absolutely loved the taste of this! Was my middle child’s favourite dinner! 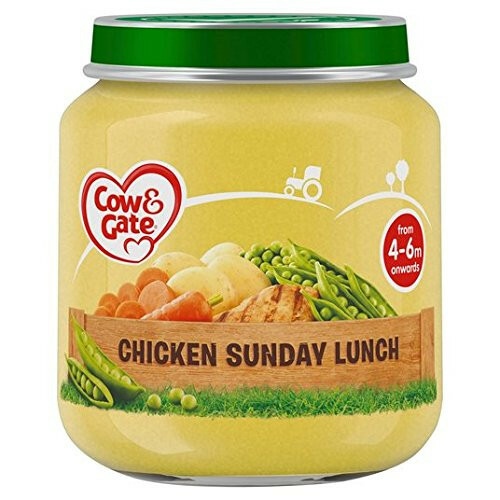 Is a bit expensive for the size of the jar but definitely worth the money, perfect for when your having a family roast and baby’s want to join in too! Such a good size jar for when out and about, easy to feed baby too!